An overview of the different seasons in the park and what each has to offer. It's really a wonderful time to visit Yosemite National Park any time of year. It's a marvel of sights and sounds, a wonderland of landscape and a magical place of beauty. But the time you visit will depend a lot on your preferences of weather and activities you desire. Of course, the weather in the Sierra Nevada Mountains is a rapidly changing picture. Depending on how high you go, you can see some quick changes in temperature and rainfall or snow. As you review the seasonal climate in the park, you can decide when will be your best time to vacation in Yosemite. Spring in Yosemite is a time of beauty as the wildflowers bloom and the earth comes alive with new life. Hiking is a favorite activity at this time, with sightseeing close behind. Backpacking options are limited, however, since snow is still heavy upon the higher elevations. There are fewer people than in the summer, although it can still become crowded on sunny days. While you are enjoying the lovely spring flowers in the lower elevations, the higher places are often still snowbound. The weather can change rapidly during the spring, and you can go from a sunny day to one that's cold and stormy pretty fast. But you should be prepared for that and come in the spring when you want to see the lovely waterfalls throughout the park in full force. As the snow melts, the peak output is reached on many of the falls, including the seasonal falls along Tioga Road. When packing for a springtime visit, ensure you bring an extra sweatshirt or jacket. Bring your rain gear so you are ready for the occasional stormy day. This is the time of the largest crowds in Yosemite National Park. It is also the most pleasant as far as weather goes. It's my favorite time of year in the park, because of the warm, dry days, the cool nights and the occasional thunderstorm lending a little excitement. 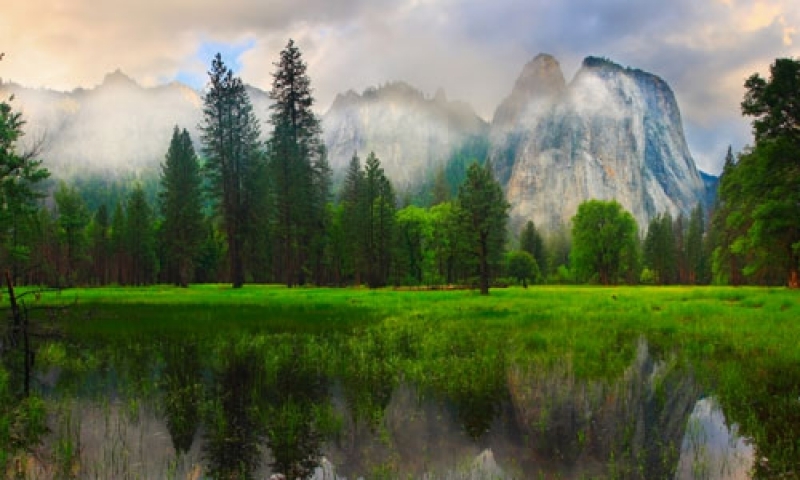 You'll find that rain happens more often in Tuolumne Meadows than in Yosemite Valley. Summer is also perfect for any outdoor fun you want to do, from hiking to sightseeing, from camping to horseback riding. At times in the valley, temperatures can reach up to 100°F, so you may want to be alerted to this and pack accordingly. Higher up in Tuolumne Meadows, temperatures will be a nice 70 in the daytime and drop into the 30s at night. Bring sunscreen because you will be outside a lot here in Yosemite, and don't neglect to bring some cool clothing. Fall sees some lessening of the crowds of summer visitors as the weather grows colder. Although daytime temperatures remain fairly warm through October, the nights definitely get chilly. You may find yourself in an early winter storm, but it won't last long. At the higher elevations, the nights by the middle of October can sink below freezing, so your excursions shouldn't include overnight stays in these areas unless you are completely ready for the cold weather. During daytime hours, you can still enjoy the sights and wander through the park taking photos of your favorite scenes. Pack smartly. Don't leave extra jackets at home. Bring warm clothes. Yosemite National Park is a great place for the snow lovers. There's plenty of skiing, snowboarding, snowshoeing and much more. Sledding in the hills provides some exciting adventures. The views are magnificent as the white covers the trees and mountainsides. Be ready for a cold, wet visit, as more than seventy percent of the precipitation for the year falls from November to March. This precipitation is usually in the form of snow. When venturing to higher elevations, above Yosemite Valley, you will find snowfall comes as early as September or October. It's easy to know what to pack in the winter, all your cold-weather gear, including a parka!